OSHA is postponing enforcement of certain requirements of the final rule on occupational exposure to beryllium in general industry. Requirements originally scheduled for enforcement on June 25 will not be enforced until Aug. 9. The requirements include beryllium work areas, regulated work areas, methods of compliance, personal protective clothing and equipment, hygiene areas and practices, housekeeping, communication of hazards, and recordkeeping. For more information, read the memorandum. With the official start of summer, OSHA is urging employers across the country to protect workers from heat-related illnesses and hazards. While workers in construction, agriculture, and landscaping are often exposed to excessive heat, so are workers in kitchens, foundries, warehouses, and other indoor settings. 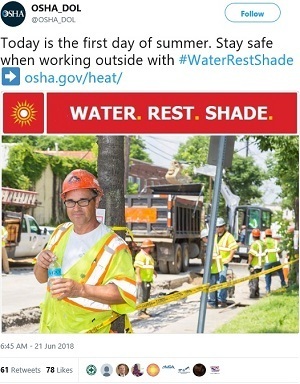 OSHA offers guidance on how to keep workers cool and healthy whether they are exposed to indoor or outdoor heat hazards. Eric Giguere shares his experience of surviving a trench collapse. 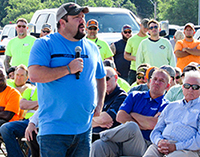 During last month’s Trench Safety Stand-Down Week, more than 600 construction workers gathered outside Kauffman Stadium in Kansas City, Mo., to learn about safe excavation practices. Speakers at the event included Eric Giguere, who described surviving a trench collapse, and how it affected his life. Presenters also discussed other excavation hazards, the increase in trench-related fatalities, and preventive measures. 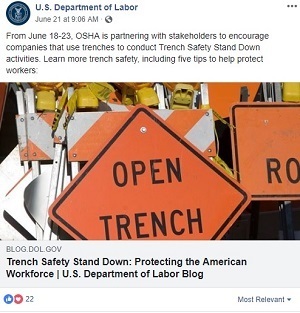 For more information, visit OSHA’s trenching and excavation webpage. JK Excavating & Utilities, Inc., faces $202,201 in penalties and was placed in OSHA’s Severe Violator Enforcement Program after an employee suffered fatal injuries in a trench collapse. Inspectors found that the company failed to: use protective systems to prevent a cave-in; remove accumulating water; properly use ladders to enter and exit the trench; prevent employees from working beneath a suspended trench box; ensure employees wore hard hats; and make provisions for prompt medical attention in the event of injury. Read the news release for more information. Crown Roofing, LLC, was fined $149,662 for exposing employees to fall hazards. After being inspected as part of OSHA’s Regional Emphasis Program for Falls in Construction, the company was cited for one repeat violation for failing to use a guardrail, safety net, or personal fall arrest system to protect workers. OSHA also issued citations for failing to have a competent person regularly inspect jobsites, materials, and equipment; and maintain written records of fall protection trainings. For more information, read the news release. The Virginia Occupational Safety and Health Program issued seven citations and $187,060 in penalties to Nestle USA after a worker’s arm became caught in a conveyor. Inspectors determined that the company failed to inspect energy control procedures annually, train workers on the control of hazardous energy, and provide adequate machine guarding. Nestle USA was also cited for these violations in 2016. Michigan OSHA issued five citations and $77,600 in penalties to Woods Carpentry, Inc., for exposing workers to fall hazards. Inspectors concluded that the company failed to train workers, and provide adequate fall protection for workers installing guardrails on balconies. The company was previously cited for these violations in 2014 and 2016. Join the more than 350 organizations worldwide that have signed up to participate in Safe + Sound Week August 13-19. 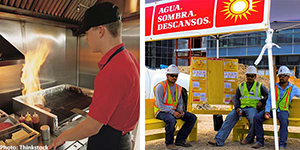 If your business is looking for ways to get started, OSHA’s Safe + Sound Week for Any Schedule guide outlines activities your organization can do if you have a day, half day, or just an hour to engage your workers. Register now to get your organization on the map. Trinity Community, a nursing home facility in Beavercreek, Ohio, contacted OSHA’s free On-Site Consultation Program to improve fire safety, noise control, lockout/tagout, and other concerns. Working with OSHA’s consultants, the nursing home instituted measures that included developing an employee safety handbook, holding an annual Safety Fair, and conducting ongoing safety education. As a result of these and other efforts, Trinity’s rates of recordable and serious injuries dropped to less than half the national average for nursing homes and it was accepted into OSHA’s Safety and Health Achievement Recognition Program. For more information, read the success story. OSHA has signed a strategic partnership agreement with engineering company AECOM, and the Southern Wisconsin Building and Construction Trades Council to promote worker safety and health during expansion of a power generation facility in Beloit. Under the agreement, contractors will present weekly training on common hazards such as falls, trenching and excavation, and silica exposure; and train workers on the proper use of respirators and personal protective equipment. The Strategic Partnership Program provides opportunities for OSHA to partner with employers, workers, professional or trade associations, labor organizations, and other interested stakeholders to create safe and healthful work environments. OSHA Deputy Assistant Secretary Loren Sweatt and CareerSafe CEO Larry Teverbaugh. CareerSafe signed a two-year agreement to provide youth aged 16-24, educators, and administrators with information and resources on the most common hazards encountered by new workers, particularly in construction, agriculture, and healthcare. For more information, read the news release. The Montana Contractor Compensation Fund signed a two-year agreement to reduce and prevent worker exposure to falls, struck-by, caught-in/between, electrocutions, amputations, cuts, lacerations or punctures, machine-guarding, and lockout/tagout hazards. Read the news release for more information. ISEA President Charles D. Johnson and Loren Sweatt. The International Safety Equipment Association signed a two-year agreement to provide information on the proper selection, use, maintenance, and storage of personal protective and safety equipment. For more information, read the news release. Two shipyard employment fact sheets detail the safe use of portable and hand‑held power tools, and the proper assessment, selection, and use of personal protective equipment.